I’ve been looking at the PlexiDor Electronic. Will my dog have to push the door open? There are electronic pet doors where the key only locks or unlocks the door, and the pet still has to push it open to go through. 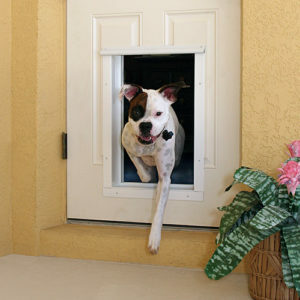 These doors are designed to keep unwanted guests out, but doesn’t provide added convenience to the pet. The PlexiDor Electronic works on a different system. When the pet approaches the door, the system reads the RFID of the collar key. If the code is right, a motor in the door pulls the panel up, kind of like a garage door. Once the pet is through, the door will close automatically.